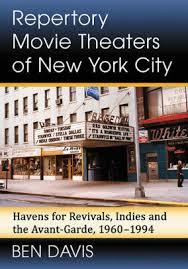 Repertory Movie Theaters of New York City: Havens for Revivals, Indies and the Avant-Garde, 1960-1994. Ben Davis. McFarland, 2017. Ben Davis’ excellent new book thoroughly explores the history, culture and importance of the repertory movie theaters that influenced the art film scene in New York City from the 1960s into the 1990s. In this well organized and impressively researched monograph, the author explains and analyzes the ways that the major repertory film theaters contributed to the film scene and to the creation of a cinephilic community – both casual and extreme- among a diverse group of filmgoers in New York City. t these theaters screened, and the events and unexpected surprises that each theater contributed to its neighborhood. Davis includes personal anecdotes, letters from fans and employees, and memorabilia that all demonstrate how vibrant and beloved these theaters were in their neighborhoods and among the cinephile community of New York City. Davis celebrates the innovative programmers and often highly mortgaged theaters that carved out such exciting opportunities for regular people to see foreign and art films and to engage with the artistic explosion of this dramatic decade. Part Two examines the Second Wave of the New York film scene that expanded rapidly throughout the 1970s, contracted in the 1980s, and died out altogether by 1994. Davis takes his readers through his exploration of the neighborhoods and the artists who shaped this moment and brought experimental art forms to the public. As New York City faced financial crises during the 1970s and then rebounded in the 1980s, the repertory theaters flourished; more theaters opened and more owners experimented with avant-garde film. Davis paints a clear picture of how city neighborhoods rallied around these theaters and eagerly supported the flamboyant characters who ran them and made daring choices about screening and themed events. He reproduces film festival posters and celebrity photos to illustrate how central these theaters were in creating an artistic space for repertory film during these tumultuous decades. ephiles to build their own communities, even if those groups met in run-down theaters that smelled like marijuana, were run by cranky old lefties, and often required a viewer to cede a favored seat to a sleeping cat. Without plummeting into sentimentality, Davis captures the beauty of these spaces and these moments. He reminds readers of the satisfaction one could gain through the simple joy of viewing an obscure film with other excited patrons in a grand old theater house. This book would be perfect for film studies, urban studies, or New York City courses, both undergraduate and graduate. This very accessible book will also appeal to a general audience interested in film history or in gaining a greater understanding of New York City’s neighborhoods and culture. Also, this book will inspire the reader to create lists of all sorts of interesting and unusual films for future viewing.